On September 28, 2005 rector Gustavo García de Paredes prevailed upon the University of Panama faculty council do declare Dr. Miguel Antonio Bernal, a constitutional law professor at the law school, who got his doctorate at the University of Bordeaux, “non grata” for among other denigrating things, calling the self-proclaimed “Rector Magnifico” García de Paredes, who bought a supposed doctoral diploma from a Franco-era diploma mill in Spain, “señor” instead of “doctor.” University attempts to fire Bernal and expel him from the campus have met with resistance from his students, public indignation and mixed results in the court. Most recently the high court ruled that it would be disproportionate for the university to fire Bernal for the sort of disrespect that characterized his expressions about the rector. 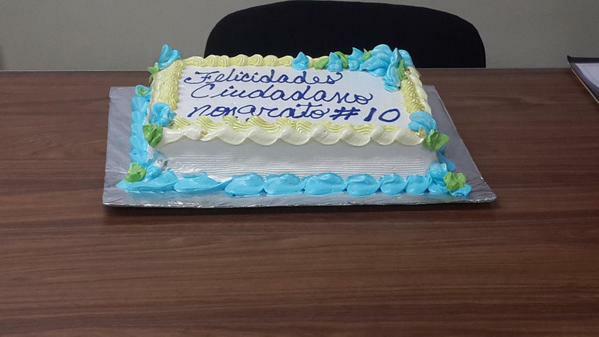 To mark the tenth anniversary of his being declared non grata, Bernal’s students gave him a birthday cake.